In this document, we will install WordPress to a server that you already have a server running in Linux, Apache2, Mysql (or MariaDB), and PHP. If you do not have a server set up yet, you can refer to this document: http://bryceautomation.com/index.php/configuring-virtual-private-server/ . We will assume that you have SSH access to your server using your terminal in Linux, or using PUTTY in Windows. WordPress is a Content Management System (CMS) that allows you to build websites graphically without having to know HTML or PHP programming. Knowledge of these languages, however would be very helpful if you need to do anything outside of the scope of WordPress. This document is “as is” You are responsible for securing your site, taking safety precautions, etc. 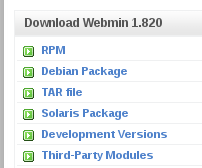 The first thing we will do is install Webmin. 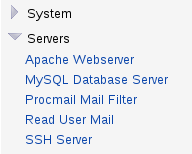 Webmin allows us to graphically configure certain features of our server such as the MySQL database, and the Apache web server. Complete the form similar to the one shown. Again, here we are mainly concerned with just getting the page running. You can always research more secure settings. To give this user all priviledges, click the top priviledge, scroll to the bottom of the priviledge list. Hold down shift and click the bottom privilege to select all privileges. Then press “Create“. 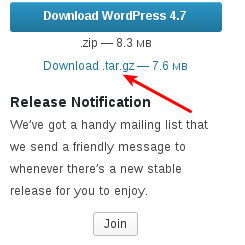 Now, we will go to https://wordpress.org/download/, and right click the download link for the .tar.gz file. We will copy the link location (or link address). Now, back in our terminal, type wget https://wordpress.org/latest.tar.gz That is wget then space, then paste the link to the .tar.gz file we just copied. Now, we must extract this file. type tar xzvf latest.tar.gz (latest.tar.gz is the name of the file we just downloaded.) If you are unsure of the name, you can type ls to list the items that are in the directory that you just downloaded to. Type ls again, and you should see the a wordpress directory within your /root directory. 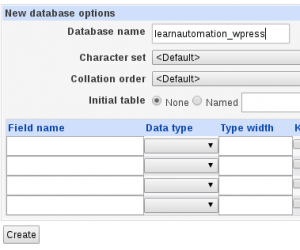 Step 14 — Moving WordPress to your public_html directory. Step 15 — Your site is ready! In your web browser, go to your domain name, and you will be asked what database, database user, and password to use, and a few other questions, then your site is good to go. You may want to search google for better securing your site with plugins and other file permission changes.